Did Casey Viator Really Gain 63 Pounds of Muscle in 28 Days? The Colorado Experiment took place in May of 1973 at Colorado State University. The purpose of the experiment was to produce a high level of muscular growth by training Casey Viator every other day, or 14 times in 28 days, in a supervised university setting. Nautilus-inventor Arthur Jones personally trained Casey for every workout. Training was intense, progressive, and involved a negative-only repetition style on 50 percent of the exercises. During the first week alone, Viator gained 27.25 pounds of solid muscle. Repeat: That’s 27.25 pounds of muscle in 7 days, or an average of 3.9 pounds of muscle per day. The facts show that during week 1, Viator gained 20.25 pounds of body weight and lost 7 pounds of fat, for a total of 27.25 pounds of muscle mass. Viator’s overall muscle mass gain in 28 days was 63.21 pounds. That was an average muscle mass increase of 2.26 pounds per day. There are a lot of speculations, accusations, and outright urban myths about the Colorado Experiment. Some are humorous, some are about disbelief, and others are malicious. I’ll address all of them below, but the inarguable fact is, Casey Viator gained an enormous amount of muscle in a very short time. The month following the Colorado Experiment I was at the AAU Mr. America contest in Williamsport, Pennsylvania, when Arthur Jones and Casey Viator released preliminary information about the results. In July of 1973, Jones recruited me to become Director of Research for Nautilus Sports/Medical Industries, and I worked in that capacity for 20 years. One of my first projects at Nautilus was to become very familiar with the Colorado Experiment. Jones had a folder that contained all the workout routines and Jones’s wife, Liza, had a notebook that she used to record Viator’s daily food intake. I still have copies of that material. All the relevant data were separated and assembled. Nautilus printed and distributed thousands of brochures on the Colorado Experiment. I published the results in several of my books, and three or four other authors did the same. My own history with Viator goes back some four years earlier than the Colorado Experiment. I first met Casey in a bodybuilding contest in Texas in 1969 and competed against him for the next two years. While at the Nautilus headquarters in Lake Helen, Florida, from 1973 to 1980, I trained and photographed Casey numerous times, especially in preparation for the 1978 NABBA Mr. Universe contest. Concerning Jones, I met him in August of 1970 at the AAU Mr. USA contest in New Orleans and visited him in Lake Helen, Florida, multiple times over the next three years. I kept in regular contact with Jones until he died in 2007. Now, let’s get to the actual facts, figures, and fiction of the Colorado Experiment. Fact – On April 30, 1973, pre-experiment measurements were taken of Casey Viator’s body composition by Dr. James Johnson, Associate Professor, Department of Radiology, Colorado State University. Fact – Casey Viator, age 21, at a height of 5 feet 8 inches, had a starting weight of 166.87 pounds. His percentage of body fat, as measured by the “potassium whole body counter,” was 13.8 percent. Fact – The experiment was conducted from May 1, 1973, through May 29, 1973, for an elapsed period of 28 days. Fact – No special food supplements were used. No growth drugs or steroids were engaged. A reasonably well-balanced diet was consumed, with Viator eating six meals per day. Fact – The last week of April 1973, 20 pieces of Nautilus equipment, including some negative-type prototypes, were delivered and moved into Dr. Elliot Plese’s Exercise Physiology Laboratory at Colorado State University in Fort Collins, Colorado. Fact – Arthur Jones and Casey Viator flew into Fort Collins and remained until the end of May. Fact – Arthur Jones personally trained Casey and pushed him to his limit on each exercise. Viator’s routines averaged 12 exercises. Each workout averaged 33.6 minutes. Fact – Viator’s ending body weight was 212.15 pounds with 2.47 percent body fat. That was an increase of 45.28 pounds of body weight, which included a loss of 17.93 pounds of fat. Fact – During the first week alone, Viator gained 27.25 pounds of solid muscle. Repeat: That’s 27.25 pounds of muscle in 7 days, almost 4 pounds of muscle per day. The facts show that during week 1, Viator gained 20.25 pounds of body weight and lost 7 pounds of fat, for a total of 27.25 pounds of muscle mass. Fact – Viator’s overall muscle mass gain in 28 days was 63.21 pounds. That was an average muscle mass increase of 2.26 pounds per day. To prevent any misunderstanding, Jones was careful to always note that Viator’s results were anything but average. They were exceptional most notably because Viator was an exceptionally gifted athlete, with long muscle bellies throughout his body. Jones also pointed out that two years earlier Viator won the 1971 AAU Mr. America, weighing 218 pounds. After winning the contest, Viator took some time off from training and returned in December of 1972, weighing 200.5 pounds. In early January of 1973, Viator was involved in a serious accident involving a wire-extrusion machine, and lost most of the little finger on his right hand. Then, he almost died from an allergic reaction to an anti-tetanus injection. As a result, from January through April of 1973, Viator did no training. In fact, most of the time he was depressed and he had little appetite. His muscles atrophied, and he lost 33.63 pounds, with 18.75 of the pounds being attributed to the near-fatal injection. Some, perhaps most, of Viator’s success from the Colorado Experiment was that he was rebuilding muscle that he had already built two years earlier. In anticipation that Casey might be accused of taking drugs during the experiment, Arthur hired the toughest guy available to shadow Casey 24/7. Who was this guy? It was Tom Wood, and I’ve spoken with Tom several times about his participation in the Colorado Experiment and he confirms Casey did not take anabolic steroids during the 28-day study. Arthur did not believe in force feeding or in “bulking” diets. A daily food diary was kept for Casey and everything he consumed was meticulously recorded. I personally examined this diary and calculated the total number of daily calories Casey ingested. He never ate more than 5,000 calories and most days were closer to 4,000, which is minimal considering the brutal workouts he was going through. Arthur employed rather flat lighting, as opposed to contrast lighting, because he wanted to influence the coaching and medical professions more than the bodybuilding world. Extreme muscularity would have been a turn off in the market that Jones most wanted to influence. I visited with Casey shortly after the completion of the Colorado Experiment and he took off his shirt and did some poses. His physique in person was significantly more muscular and ripped, compared to the flatness that was displayed in the after photographs. Considering those measurements, along with the flat lighting of the comparison photos, then a gain of 45.28 pounds of body weight and 63.21 pounds of muscle are, in my view, much more plausible. Casey had what I considered to be one-in-a-million genetics for bodybuilding. So duplicating the results would be extremely difficult, especially considering Viator was mostly rebuilding muscle he had previously built. Even though they don’t have the genetics of Casey, I’ve put a number of above-average men through programs similar to the Colorado Experiment. David Hudlow built 18.5 pounds of muscle in 11 days. Documented in The New High-Intensity Training. Eddie Mueller built 18.25 pounds of muscle in 10 weeks. Documented in Massive Muscles in 10 Weeks. Todd Waters built 15.25 pounds of muscle in 6 weeks. Documented in High-Intensity Strength Training. Jeff Turner built 18.25 pounds of muscle in 4 weeks. Documented in GROW. Keith Whitley built 29 pounds of muscle in 6 weeks. Documented in Bigger Muscles in 42 Days. David Hammond built 22.5 pounds of muscle in 6 weeks. Documented in Bigger Muscle in 42 Days. Joe Walker added 17.38 pounds of muscle in 6 weeks. Documented in The Body Fat Breakthrough. Shane Poole built 19.34 pounds of muscle in 6 weeks. Documented in The Body Fat Breakthrough. I’ve tried to be as straightforward as possible concerning the Colorado Experiment. Am I biased because of my experiences with Arthur Jones and Casey Viator? Possibly, to some degree, because I really liked both of them. On the other hand, I try to keep objectivity in the forefront of my thinking. 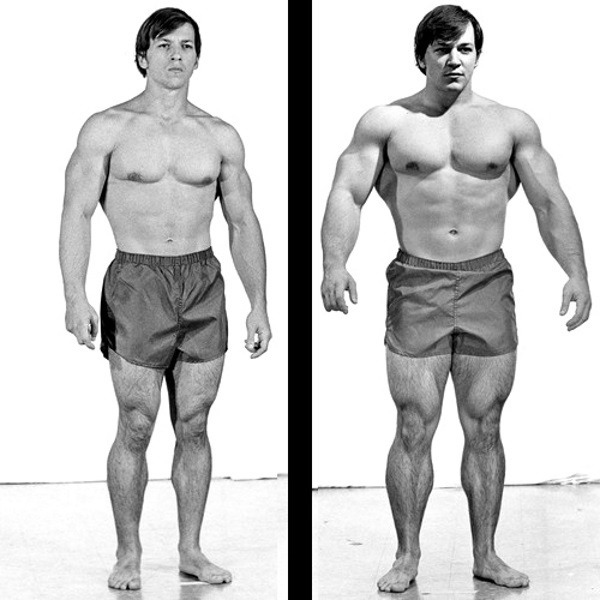 Looking back to the 1973 Colorado Experiment, Arthur Jones’s major goal was to demonstrate to the coaching and medical professions that rapid and large-scale increases in muscle mass are produced by the proper application of exercise. Jones’s marketing of Viator’s overall results certainly achieved the awareness he desired for many years. Jones did not, however, anticipate the fervent interest the study generated from bodybuilders, or the ongoing speculation that it has received for more than 40 years. And neither did Viator. Jones died in his sleep on August 28, 2007. He was 80 years old. Viator died much younger, at age 62, from an unexpected heart attack on September 4, 2013. They are both missed. May the reexamined and more complete facts of the Colorado Experiment continue to fascinate and provoke the attention of bodybuilders throughout the world. This is the first time these workouts have ever been published anywhere. The original Colorado Experiment utilized 20 Nautilus exercise machines, some of which were negative-only prototypes that were never commercially available. The following workouts were adapted by Jones and me for use with free weights and a few conventional strength-training machines. Arthur speculated that, even though these workouts don’t include specialized Nautilus machines, they would still produce about 75 percent of the results. You probably have the potential to get very strong in the negative-only exercises. Finding dependable spotters is a key requisite in doing your best in replicating the Colorado Experiment. Good luck. One Extremely Intense Set – Perform one extremely intense set of each exercise listed in a workout. You’ve heard the term “leave it all in the gym.” I want you to “leave it all in the set.” This type of training is brutally hard. And if you find yourself wanting to do another set of an exercise, rest assured, you’re doing it dead wrong. Some workouts list certain exercises more than once, but never back-to-back. Regular Style Exercise – Regular style exercise is where you perform both the positive (lifting) phase and the lowering (negative) phase of each repetition. Perform both phases smoothly, lifting the weight in 1 to 2 seconds and lowering the weight in 2 to 3 seconds. Continue each regular-style exercise until it’s impossible to do the full-range positive phase. Negative-Only Style Exercise – You need one or two spotters to perform most negative-only exercises. Spotters help you lift the weight into the starting position so that you can lower the weight, unassisted. Load the bar or machine with 30 to 40 percent more resistance than you could regularly handle. Spotters help you lift the bar or movement arm to the top position and make a smooth transfer to your contracted muscles. You lower the resistance slowly back to the starting position in 4 to 8 seconds, and repeat the procedures for 6 to 8 controlled negative-only repetitions. Discontinue a negative-only exercise when you are unable to lower weight in 3 seconds. Rep Ranges – For regular exercises, select a weight that allows the performance of between 7 and 10 repetitions. For negative-only exercises, select a weight that allows the performance of between 6 and 8 repetitions. Once you can perform the maximum of a rep range in good form, add 5 percent more weight the next time you do the exercise. Progression – Attempt constantly to increase the number of repetitions or amount of weight, or both. Never sacrifice form in the attempt to make progress. Metabolic Conditioning – Metabolic conditioning is an important part of the Colorado Experiment. To maximize this effect, without limiting strength and muscle gains, start off by resting no more than one minute between sets. The goal, however, is to decrease rest periods to 30 seconds, which should be done over several workouts. Decreasing rest periods too quickly will impair strength and muscle gains. Training Partner – For best gains, team up with a serious training partner who can reinforce proper form and intensity on each exercise, as well as spot you on negative-only exercises. If you train with a partner, do not take turns on each exercise. Each person should complete an entire workout prior to switching to the other person. Workout Journal – It’s very important to keep accurate records – date, exercises, order, resistance, repetitions, and overall training time – of each workout. Complete exercise descriptions are listed at the end of the article. Behind-Neck Pull-Up – Negative Only: This exercise uses a horizontal chin-up bar. You also need a sturdy bench. Perform the positive work by stepping up on the bench and the negative work by lowering your body with your arms. Take an overhand grip on the bar, with your hands approximately 12 inches wider than your shoulders. Climb into the top position and place the bar behind your neck. Your elbows should be down and back. Hold the top position tightly and ease your feet off the bench. Lower your body slowly in 6-8 seconds. At the bottom, stretch briefly, and climb back quickly to the top, and begin another negative rep. You should feel this exercise deeply in your biceps, lats, and shoulders.Note: It’s doubtful that you’ll need to add resistance with a weight belt. If you can achieve at least 6 repetitions the first time you try it, you’ll indeed be a prime suspect for growth. Bench Press with Barbell – Negative Only: You need one or two spotters to lift the bar. Load a barbell on the supports of a flat bench with 30 percent more resistance than you regularly handle for 6-8 reps. Set up on the bench and grasp the barbell with your hands positioned slightly wider than your shoulders. Have the spotters lift the bar into the starting position. The barbell should be directly above your shoulders. Lower the bar slowly in 4 to 8 seconds to your chest. When you touch your chest, the spotters lift the bar back to the top position. The spotters lift 80 percent of the resistance, while you guide the barbell properly to the top. As they transfer the resistance securely in your hands, take a deep breath, and continue the slow negatives for the required repetitions. Bent-Armed Pullover with EZ-Curl Bar – Regular: I prefer an EZ-Curl to a straight bar because it relieves excess torque from of the wrists and allows external rotation of the humerus, which is a safer position for the shoulders. Place a loaded EZ-Curl bar on the floor at the head end of a sturdy bench. Lie face up on the bench, with your head off the end. Reach overhead and down and grasp the EZ-Curl bar with narrow hand spacing. Anchor your lower body, arch your back slightly, and pull the bar up and over your torso to your chest. The bar should be resting across your chest on your sternum. Move the bar back over your head toward the floor. Stretch your lats and shoulders gradually at the bottom. Do not straighten your arms. Keep them bent throughout both the positive and negative phases. Note: The involved pulling muscles have the potential to be big and strong. Don’t be afraid eventually to use 150 pounds or more on this exercise. But be careful at first on increasing the range of movement; do so gradually. Bent-Over Row with Barbell – Regular: Place your feet close together under a loaded barbell. Bend over and grasp the barbell with an underhand grip. An underhand grip, compared to an overhand grip, places your biceps in the strongest position. Your hands should be 4-6 inches apart. Your torso should remain parallel to the floor. Keep a slight bend in your knees to reduce the stress on your lower back and hamstrings. Pull the barbell up to your waist. Pause in the top position and try to pinch your shoulder blades together. Lower slowly to the bottom and stretch. Biceps Curl with Barbell – Negative Only: Load a barbell with 30 percent more resistance than you handle regularly for 10 repetitions. Have a spotter at both ends of the barbell lift the resistance to the top position of the curl. Grasp the bar with a shoulder-width underhand grip. Anchor your elbows firmly against the sides of your waist and keep them there throughout the exercise. Lower the bar slowly in 4 to 8 seconds to the bottom. As soon as you reach the bottom, the spotters lift the bar back to the top. The spotters need to perform the positive, lifting phase quickly and the transfer must be handled smoothly. Again, it’s your job to lower slowly under control. Note: The biceps curl with a barbell was one of Arthur Jones’s all-time favorite exercises and that’s why he often included it in his barbell routines. When Jones was in the best shape of his life, he weighed 200 pounds. He told me that at that weight he was able to curl a 180-pound barbell for 10 solid repetitions. That took some very strong biceps muscles. Chin-Up – Regular: Grasp a horizontal bar with a shoulder-width, underhand grip. Hang at arm’s length and bend your knees and cross your ankles. You should return to this dead-hang position each time you lower your body. Pull your head and chest toward the bar. Once your chin is over the bar, move your upper arms down and squeeze your shoulder blades together. Lower your body smoothly to the dead-hang position. Repeat for maximum repetitions. Chin-Up – Negative Only: Again, use a sturdy bench to climb into the top position. The idea is to do the positive by stepping up into the top position and the negative work with your arms. Place the bench directly under a horizontal bar. Climb into the top position with your chin over the bar. Hold on to the bar with an underhand grip and space your hands shoulder-width apart. Remove your feet from the chair or bench. Lower your body very slowly in 6-8 seconds. Make sure you come all the way down to a dead hang. Climb back quickly into the top position. Note: To add weight, use a weight belt and attach an appropriate weight on the chain. Some trainees can use from 60 to 100 pounds of attached weight on this exercise. Dip – Regular: Mount the dip bars and extend your arms. Bend your knees and cross your ankles. Lower your body slowly by bending your elbows until your upper arms dip just below your elbows. Push back to the starting position. When you can successfully do 10 or more dips, use a weight belt to add resistance. Dip – Negative Only: Most trainees will require extra resistance added to their body weight with a weight belt. Climb into the top position of a dip station and straighten your arms. Remove your feet from the step support and stabilize your body. Bend your arms and lower your body slowly in 6-8 seconds. Feel the stretch by going just below where your upper arms are parallel to the floor, which shouldn’t be painful. Climb back to the starting position and straighten your arms. Note: Dips were one of Casey Viator’s favorite exercises. He could do more than 30 regular dips in strict form, and I’ve seen him do 10 negative-only dips with 270 pounds attached to his body. Lat-Machine Pulldown to Chest – Regular: Stabilize yourself under the lat machine and grasp the overhead bar with an underhand grip. Your hands should be about shoulder width apart. Pull the bar smoothly to your upper chest. Pause. Return slowly to the stretched position. Repeat for 7 to 10 repetitions. Note: Arthur Jones was partial to applying the lat-machine pulldown immediately after the bent-armed pullover – and he used this combination frequently in his workouts. Lateral Raise with Dumbbells – Regular: Grasp a dumbbell in each hand and stand. Lean forward at the waist approximately 20 degrees from vertical. Stay in this leaning-forward position throughout the exercise. Lock your elbows and wrists and keep them locked throughout the exercise. All the action should be around your shoulder joints. Raise your arms sideways. Pause briefly when the dumbbells are slightly above horizontal. Make sure your elbows are slightly bent. Lower the dumbbells slowly to your sides. Leg Curl Machine – Negative Only: You need a spotter to do the lifting portion of this exercise. Place 30 percent more resistance on the weight stack than you regularly use for 10 reps. Lie facedown on the machine with your knees on the pad edge closest to the movement arm. Make certain your knees are in line with the axis of rotation of the machine. Grasp the handles provided to steady your upper body. The spotter helps you lift the movement arm to the contracted position. Pause and make a smooth transfer of the resistance to your contracted hamstring muscles. Lower the resistance very slowly in 4 to 8 seconds. Use the spotter to get back to the top position and continue the negative leg curls until you can no longer do at least a 3-second descent. Leg Extension Machine – Negative Only: You need a spotter to do the lifting portion of this exercise. Place 30 percent more resistance on the machine than you regularly do for 10 repetitions. Sit in the machine and place your feet and ankles behind the roller pads. Align your knees with the axis of rotation of the movement arm. Lean back and stabilize your upper body by grasping the handles or the sides of the seat. The spotter helps you lift the movement arm into the fully contracted top position and make a smooth transfer of the weight. You lower the weight in 4 to 8 seconds back to the starting position. Immediately, the spotter grabs the movement arm at the bottom and helps you quickly get it back to the top position. Continue performing reps until you can no longer manage a 3-second negative. Overhead Triceps Extension with Dumbbell – Regular: Hold a dumbbell at one end with both hands. Press the dumbbell overhead. Place your elbows in tight and close to your ears throughout the exercise. Bend the elbows and lower the dumbbell slowly behind your head. Don’t move your elbows. Only your forearms and hands should move. Be careful in the bottom position, where the triceps are stretched and vulnerable to strains. Move in and out of the bottom position gradually with no jerks. Press the dumbbell smoothly back to the extended position. Overhead Press with Barbell – Regular: Stand and place a barbell in front of your shoulders with your hands slightly wider than your shoulders. Keep your feet shoulder width apart. Press the barbell overhead smoothly. Do not slam into the lockout. Keep a slight bend in your elbows at the top, which will keep the active muscles loaded. Lower the weight under control (2 to 3 seconds) to your shoulders. Do not bounce the barbell off your shoulders at the bottom. Make a smooth turnaround. Shoulder Shrug with Barbell – Regular: Take an overhand grip on a barbell and stand erect. Your hands should be slightly wider apart than your shoulders, and the bar should be touching your thighs. Relax your shoulders forward and downward as far as comfortably possible. Shrug your shoulders upward as high as possible. Pause briefly at the top. Lower slowly to the stretched position. Squat with Barbell – Regular: Place a barbell on a squat rack and load it with an appropriate weight. Position the bar behind your neck across your trapezius muscles, and hold the bar in place with your hands. If the bar cuts into your skin, pad it lightly by wrapping a towel around the bar. Lift the bar off the rack and move back one step. Place your feet shoulder-width apart, toes angled slightly outward. Keep your upper-body muscles rigid and your torso as upright as possible during this exercise. Bend your hips and knees and smoothly descend to a position whereby your hamstrings firmly come in contact with your calves. Without bouncing or stopping in the bottom position, slowly make the turnaround from negative to positive. Lift the barbell back to the top position. Stiff-Legged Deadlift with Barbell – Regular: Even though this exercise is called a stiff-legged deadlift, it should be performed with a slight bend in your knees. This protects the lower back and the hamstrings. Stand over a barbell, bend your hips and knees, and grasp the bar with an overhand grip with your hands shoulder-width apart. Extend your hips and knees and lift the barbell smoothly to a standing position. Lower the barbell smoothly while keeping a slight bend in your knees. Touch the floor lightly with the barbell, but do not come to a stop. Lift the barbell smoothly to the standing position. Repeat for 7 to 10 repetitions. Note: Ease into the stiff-legged deadlift, especially if you have tenderness or pain in your lower back or tight hamstrings. Wrist Curl with Barbell – Regular: Grasp a barbell with a palms-up grip. Sit down and rest your forearms on your thighs and the backs of your hands against your knees. Lean forward until the angle between your upper arms and forearms is less than 90 degrees. This position allows you to isolate your forearms better. Curl your hands smoothly by contracting your forearm muscles. Pause briefly. Lower the barbell slowly.